Execution is the essence of business agility. An agile business needs to move rapidly to capitalize on business trends. However, a business move intended to be agile will most likely fail if it is executed too slowly. Barriers to agile execution abound, though IT infrastructure is frequently a root cause of this unfortunate outcome. There are no easy fixes. However, virtualization is now able to offer managers the ability to execute the quick deployment and scaling of IT systems that can support agile business initiatives. That said, not all virtualization technologies have the same capacity to impact truly cost effective, agile businesses. This paper will examine the distinctive capabilities of a virtual server infrastructure that combines Microsoft Hyper-V technology found in Windows Server 2008 R2 and AMD Opteron multi-core processors. This combination presents a uniquely powerful mix of rapid deployment cycles, agile virtualization capacity, and performance. 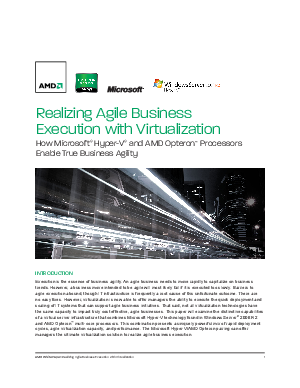 The Microsoft Hyper-V/AMD Opteron pairing can offer managers the ultimate virtualization solution to realize agile business execution.